Musician and computer science PhD candidate Jamie Ferguson teamed with the European Space Agency to develop a unique sonification of early and contemporary maps of our sky. As described at the ESA’s website, “The improvement in the quantity and precision of data, as well as the increased information content and dimensions contained in each catalogue, are palpable as the sound clip evolves from the ancient Hipparchus to the modern Hipparcos.” Hipparchus is the ancient Greek astronomer, while Hipparcos is the name of the ESA satellite. The post goes into great detail about how each of the “stellar catalogues” was translated into sound, noting what parameters were paid attention to, and how they were transposed — pitch to star brightness, for example, and volume to distance. Audio originally posted at soundcloud.com/esa. More from Ferguson at jfergusoncompsci.co.uk. 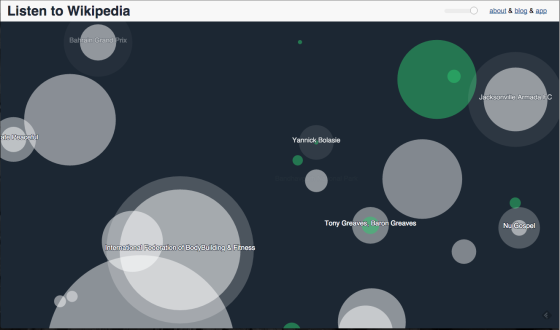 Audible tones and expanding, colored circles are used in tandem to announce changes to the vast collaborative encyclopedia thanks to the great online tool Listen to Wikipedia (listen.hatnote.com), one of the best examples of realtime sonification on the web. Developed by Stephen LaPorte and Mahmoud Hashemi, it’s the subject of a short recent interview from radio station KQED. The conversation with Hashemi goes into the background of the tool. 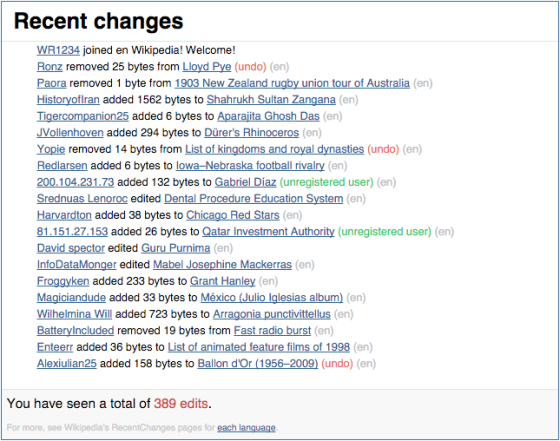 He talks about the software’s actions, and how it serves both as an expression of Wikipedia and as a response to the economic focus of Silicon Valley. Bells indicate additions and string plucks indicate subtractions. Pitch changes according to the size of the edit; the larger the edit, the deeper the note. Green circles show edits from unregistered contributors, and purple circles mark edits performed by automated bots. Track originally posted at soundcloud.com/kqed. The KQED story was produced by Sam Harnett, of the podcast The World According to Sound (theworldaccordingtosound.org). Check out Listen to Wikipedia at listen.hatnote.com. It’s also available as a free iOS app (itunes.apple.com). The Studio 360 podcast recently focused its microphones on “The Blind Astrophysicist,” as the episode was titled. Its subject is a sight-impaired astrophysicist named Wanda Diaz-Merced, who is from Puerto Rico. According to the reportage, Diaz-Merced began to lose her sight as she was pursuing her studies. She talks in the interview (MP3) about how all her fellow students were straining their eyes to read all the tiny markings in their research data, while she was much more aggressively losing her own vision. 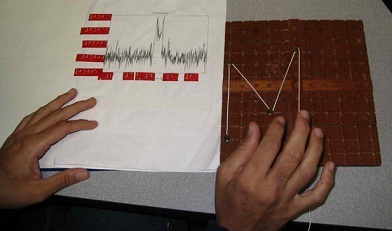 Above is an image from the Studio 360 blog, showing “a graph marked with Braille tags on a pegboard to plot the intensity of light versus frequency for a spiral galaxy. She can figure out the mass of the galaxy by calculating the area under the curve.” It’s just one example of how Diaz-Merced pursues her research not just despite her diminished sense, but because of the manner in which she has learned to make all the more of her retained senses. Original post at studio360.org. The Studio 360 site provides this link for additional info on Diaz: icad.org. Subject originally located via “Senses Working Overtime,” from the blog of my old friend Andrew Jaffe (we went to college together), who is an astrophysicist himself, at Imperial College in London; he also provided this link to Diaz-Merced’s research at Harvard: harvard.edu.